In Dubai, it’s actually illegal to be in debt. Bouncing a cheque is a jailable offence. So, expats faced with crippling debts have taken to abandoning their cars – usually with the keys in the ignition, and sometimes with maxed-out credit cards in the glovebox – and skipping town for good. 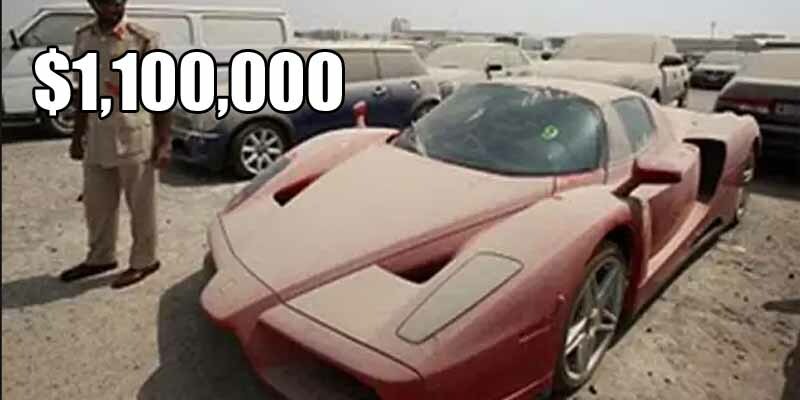 This dusty Ferrari Enzo is the ultimate expression of this worrying trend. Its British owner allegedly fled, abandoning the $1.1 million car after failing to pony up for a series of traffic fines. The car was then seized by the police. After a flood of reports claiming the Enzo was headed to the auction block, the authorities revealed that along with nine other cars (including a Ferrari 599 and 430 Spider), it is the subject of an Interpol investigation concerning its theft.